Set in 1873 and the wilds of Arizona, a stranger rides into the little mining town of absolution. He has been shot, lost his memory and is a wanted man for a list of crimes longer than his arm, on said arm is a rather out of place piece of equipment. Unbeknownst to him, he was abducted by aliens, a notion far removed from any of the other townsfolk, that is, until it starts happening to them. You see it turns out an alien race has set its sights on the gold in them thar hills and will do just about anything to make sure they get it all and in the process wipe out man kind. With the help of rag-tag team of local townsfolk and the stolen piece of alien tech attached to his arm, our intrepid abductee heads out to reclaim the captured humans and put a stop to the dastardly plan of beings from another world. I guess my biggest problem with the film was my expectation, its not like you go into a movie like Snakes on a Plane expecting to see anything less than some snakes on a plane and whilst cowboys and aliens certainly do appear on the screen and even in the same shot, the film just doesn’t live up to the mental image you have just by saying the title aloud. The film had so much potential and features a great cast including Harrison Ford, Daniel Craig, Olivia Wilde, Sam Rockwell and many TV stalwarts and yet they are given very little to work with! I don't think Jon Favreau really knew if he was making a western or a sci fi as the look of the film kind of fails at both. Whilst we do get some pretty landscape shots and the obligatory Magnificent Seven homage for the most part the film looks quite dull and underwhelming (At least it wasn't in 3D though!). 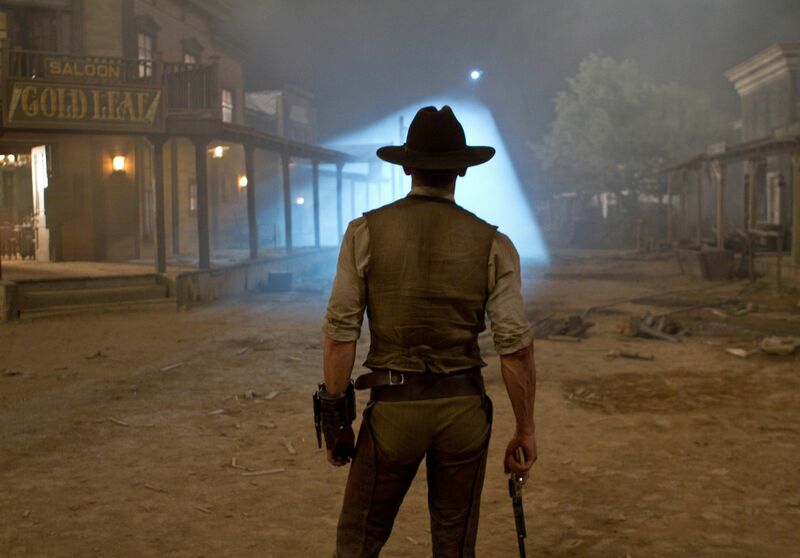 In the end Cowboys & Aliens should have been a fun ride, but it takes itself far too seriously and has a story that really didn't need to involve aliens at all, which just adds to the fact that it could have been an outright western, but instead leaves you wanting. The movie really isn't too bad, but it isn't a landslide movie. It's one of those movies which they will play over and over, like Independence Day, during the summer months.